For the first time since early October, the UBC men’s hockey team took to the ice looking to extend a win streak. After a rocky run last month that saw them lose five of six games, the team was able to get back on track with a pair of road wins over the Manitoba Bisons before returning to Doug Mitchell for a two-week homestand. Able to capitalize on the momentum of their victories in Manitoba, the team extended their win-streak to four games following a pair of solid wins over the Regina Cougars. Friday night’s game saw rookie Maxwell James post a pair of second period goals, including the ultimate game-winner as UBC edged out the Cougars 2-1. Though James was held off of the scoresheet on Saturday, he remains the team’s leading scorer with seven goals and five assists on the year, tied at the top of the Canada West rookie scoring race. Goalie Rylan Toth’s 20 saves on 21 shots would prove enough for the ’Birds, despite Regina’s third-period push, as he would pick up his sixth win of the season. Hungry for their second straight weekend sweep, the Thunderbirds started strong in Saturday’s afternoon game, posting a four-goal first period and fending off the Cougars by a score of 5-3. Rookie netminder Patrick Dea picked up his third win of the season, turning aside 29 shots on the afternoon. UBC’s fourth consecutive victory is all the more impressive considering that they played with a short bench. The team carried just nine forwards into Saturday’s matchup and finished with only eight. Veteran forward Chase Clayton was ejected following a scrap with the Cougars’ Tyler Adams, as Clayton responded to a questionable hit early in the second period. 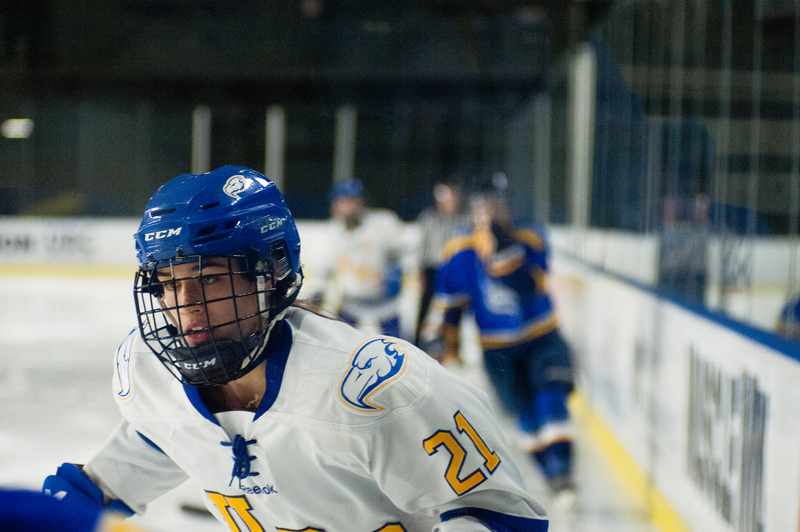 The UBC women’s hockey team was also able to post a sweep over the Regina Cougars as they start a four-game road swing over the coming weeks. The Thunderbirds opened the double-header on Friday night with a strong outing, shutting out the Cougars 3-0 and won a nail-biter 2-1 in a shootout on Saturday. The team made Regina pay with their powerplay unit, posting two, one-man advantage goals in the second period of Friday’s game and one in the second period of Saturday’s game. UBC was 3 for 11 on the weekend with the extra skater, as their special teams unit looks to break out of a slump – their powerplay had been just 1 for 23 in their last six games prior to this weekend. Thunderbird goalie Tory Micklash got the nod for both starts, looking to build on her stellar campaign so far this season. She would surrender just one goal on 49 shots throughout the weekend and would be pivotal to securing the shootout win in the Saturday matinee game. Micklash’s routinely excellent weekend has her sitting with a ridiculous 0.84 goals-against-average and a 0.961 save percentage, good for second best in the league in both categories ­— top amongst UBC’s goalkeeping team. The women’s and men’s volleyball teams were back in action over the weekend as they hosted the Saskatchewan Huskies. The women’s team played the minimum number of sets, handling the Huskies 3-0 in each of a pair of decisive victories. With the weekend sweep, the team continues to build on their longest win streak of the season. They are winners of their last four as they head into the December break. The squad has been one of the hottest in the Canada West division since the start of November, as they climbed from 0-3 to 7-5 ­— good for fourth in the league standings. The wins over the Huskies gave UBC’s Kiera Van Ryk the opportunity to remind everyone how dominant she is, posting 19 kills on Friday and adding 20 more in Saturday’s matchup. The reigning U Sports Rookie of the Year sits tied for second in the league for kills, on both an absolute and per set basis. UBC’s service game was also particularly proficient on the weekend, as they posted 19 aces across the 6 sets, including 7 by third-year setter Olivia Furlan. Furlan’s solid weekend has moved her into the league lead for service aces per set. 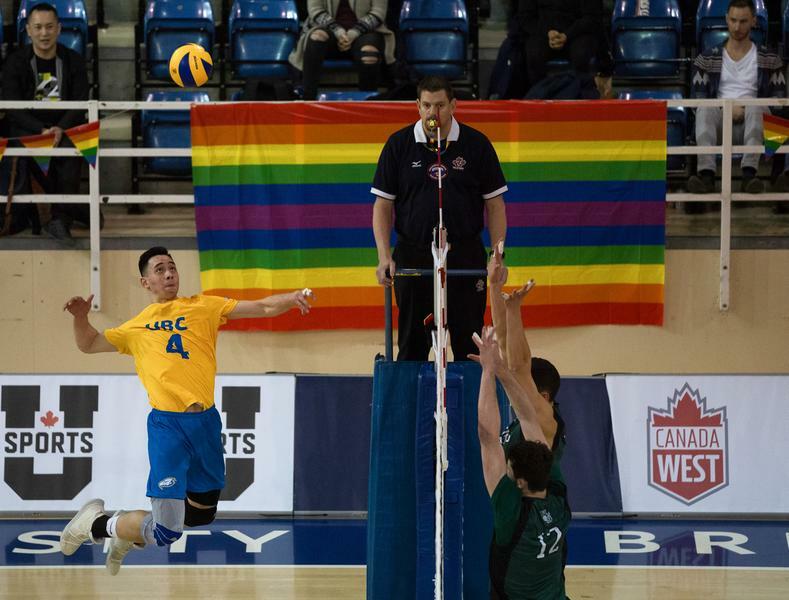 Following a weekend that saw the UBC men’s volleyball team pick up their first win of the season, the Thunderbirds continued to build on the cushion between themselves and the winless UBC Okanagan team that occupies the basement of the Canada West standings. 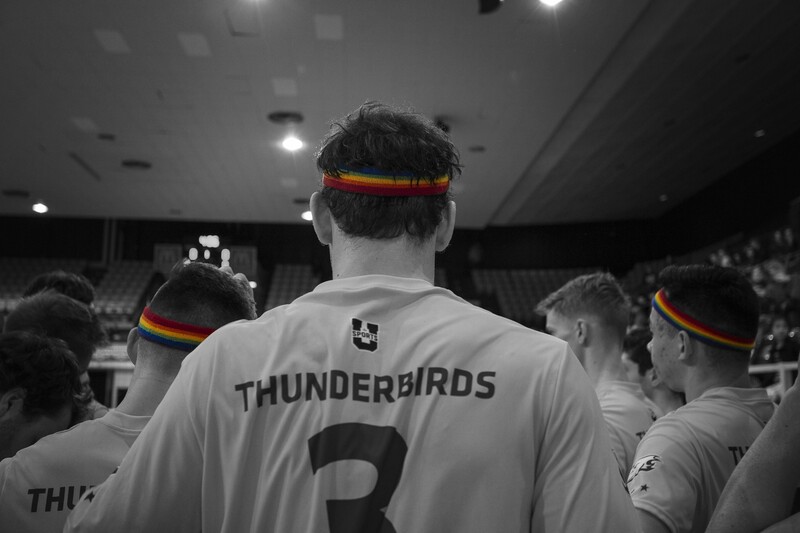 Friday’s matchup saw the ’Birds down the Huskies for their second straight home win, 3-1, but they would drop Saturday’s Pride Night rematch by the same margin to split the series. Though their first win-streak of the season was snapped on Saturday, they posted a decent performance – all their sets were tightly played and were competitive to the final point. 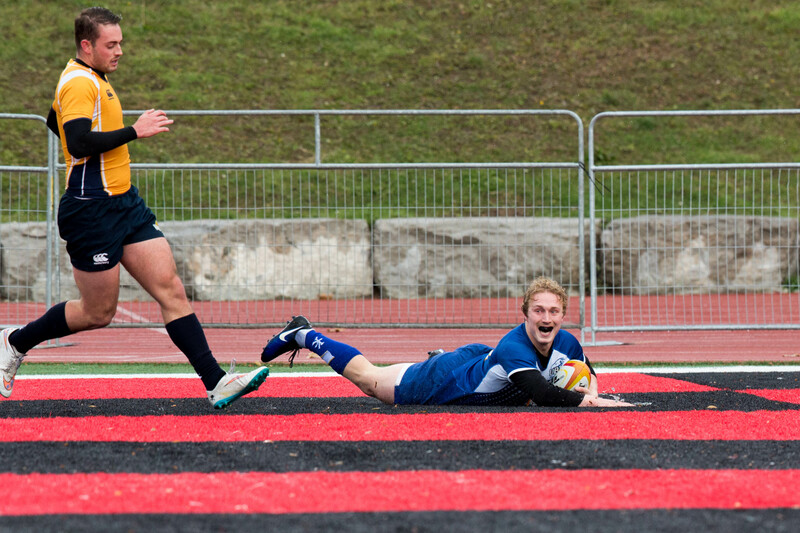 The men’s rugby team defeated the Queen’s Gaels 21-10 on Sunday to capture their second straight title at the Canadian University Men’s Rugby Championship. The Gold Medal victory capped off a solid tournament that saw the Thunderbirds cruise through the group-stage games, defeating Concordia 41-8, and Guelph 34-7. In Sunday’s matchup, the first half was a defensive battle that saw Queen’s hold the typically high-scoring squad to just a penalty goal — entering halftime, the Gaels led the Thunderbirds 7-3. UBC would score a try each for Joseph Sourisseau and Cole Keffer to take a commanding lead during second-half action. The explosive half was capped off by Will Percillier’s third penalty goal of the match, as the team closed out the victory by an 11-point margin. Eight Thunderbirds were named to the tournament’s Championship XV, including Percillier, Nick Frost, Connor Sampson, Cali Martinez, James Carson, Nick Carson, Michael Smith and Elias Ergas. The strong UBC representation in the all-star lineup is a testament to the strength of a UBC roster that has dominated intercollegiate play over recent years. For the sixth straight year, the men’s and women’s swim teams swept the Canada West Conference banners. The women’s side crushed the competition en route to their 10th consecutive title, outscoring the runner-up Calgary Dinos by 274 points — ending with a 969-point total. The men’s side was more closely contested, with the Dinos falling just 98.5 points behind UBC’s 800. Markus Thormeyer took home men’s Swimmer of the Meet, following first-place finishes in the 400-metre individual medley, the 200-metre freestyle, 4x100-metre freestyle relay, 4x200-metre freestyle relay and the 50-metre backstroke. After picking up individual silver medals and team golds, Alex Pratt captured Rookie of the Meet. Though UBC’s Hoi Lam Karen Tam didn’t pick up Swimmer of the Meet honours for the women’s side, she had one of the many impressive performances that the women’s team put forward. She would finish the event with five gold medals, including both the 50-metre and 100-metre freestyle, for which she set new Canada West records. Head coach Steve Price was awarded Canada West Coach of the Year for both the men’s and the women’s sides.